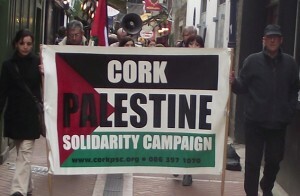 Saturday 28th June will see the Cork branch of the IPSC gather in Daunt Sq at 1.00pm for the end-of-month Boycott Israeli Goods awareness demo in Cork. We’re asking you to take an active part in the worldwide BDS movement. International solidarity with Palestine is important. Over just the last few days, five families have lost their sons, killed by Israeli troops. Hundreds of Palestinians have been arrested, and Israel is set on doubling the number of Palestinians held without charge or trial. Palestinians in Gaza, living under an illegal and inhuman siege, never know when they will be attacked by an Israeli airstrike. They are living intolerable lives. We have a critical responsibility to shine a light on the cause of this suffering – Israeli occupation, apartheid and ethnic cleansing. There will be a short meeting after the demo – if you’d like to be more involved, please be there.